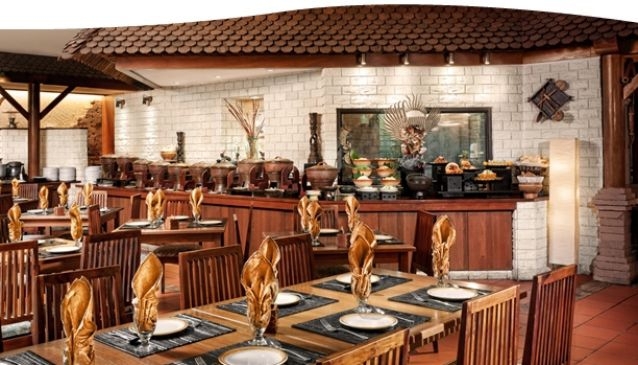 Savour the best traditional and fusion Indonesian cuisines at Kintamani Indonesian Restaurant. The authentic flavours blend perfectly with the spices from the Java land, to bring about an array of delightful dishes on the buffet table. Have a taste of the popular Gado-Gado with peanut sauce, Satay, Beef Rendang, Soto Ayam, Tahu Telor and Mango Salad, as well as, the irresistible desserts, Chendol and Durian Pengat. The restaurant, with all its cosiness and culturally rich Indonesian décor, creates a perfect ambience for guests to enjoy the delicious Indonesian food. It is no wonder why Kintamani Indonesian Restaurant at Furama RiverFront near Singapore River, is still the talk of the town when it comes to great Indonesian fare.